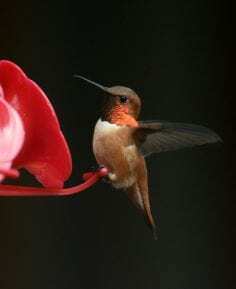 BC SPCA > FAQs > Wildlife > Is it okay to feed hummingbirds? Is it okay to feed hummingbirds? Nectar feeders provide a food source for hummingbirds in winter, but they must be cleaned regularly to prevent fungal or bacterial growth. Feeders often attract unusually large numbers of hummingbirds to one area – this can be a joy to watch, but also means any fungus or bacteria in the feeder will affect many birds. These infections can cause their tongues to swell and often result in death, a sad outcome for birds and bird lovers. If you commit to winter feeding, you must commit fully. Non-migratory hummingbirds may come to rely on this food source and will suffer if it is interrupted. Don’t put hummingbird feeders out if you’re not prepared to clean and maintain them. Clean feeders with a solution of one part white vinegar to four parts water about once a week. Change the nectar solution every few days, ensure it never freezes, and can be provided through the whole winter. Have a friend or neighbour check your feeder if you’re away. In harsh temperatures, you may need to bring your feeder in at night and defrost it if necessary. While there are many different recipes available online, this is the only one we can recommend, and use at our own Wild Animal Rehabilitation Centre. White sugar is closest to the sugars they find in nature, other types of sugars or recipes could make them sick and die. Read more about feeding birds and other wildlife (PDF).